Mother Nature can be cruel. If you have chosen Belgard for your hardscape projects, you’ve already taken measures to increase resistance against weathering and corrosion. Still, seasonal hardscape maintenance is encouraged to preserve the beauty and integrity of your installation. Here are a few Spring paver care tips. Clean your pavers each Spring with a coarse-bristle “stable” broom and a routine maintenance paver cleaner to keep them looking like new. Some weeds, if left unaddressed, can shift pavers apart over time. Be sure to periodically apply a granular weed preventative between joints as a part of your paver maintenance routine. Be careful when cleaning your Belgard pavers with power washers as they can remove the paver finish and expose the aggregate on the paver’s surface. Before applying any paver cleaning solution to your hardscape, test a small inconspicuous area first to be sure you get the desired results. Be sure to read and follow the directions printed on container labels for cleaning solution use, application, precautions and first aid. Always rinse the solution off thoroughly after use. For tough stains, use a specialized cleaner to treat the specific stain. Techniseal offers specialty cleaners for organic stains (moss, mildew, dead leaves, blood, wine); greasy stains (motor oil, barbecue, oily foods); rust (caused by steel, rusty objects or fertilizer); and paint, tar or rubber (including gum). Each of these products are specifically formulated to clean pavers and masonry and should not affect the color or tone of your hardscapes. However, it is always a good idea to test a small area area first. The joints between paving stones are the most vulnerable areas of any installation. Keep these joints topped off with jointing sand to prevent the sand-bedding layer below from deteriorating, causing the pavers to shift. Every three years, apply a sealer to keep your pavers looking their best. Depending upon your preference, sealer options can offer a natural matte finish, a color-boosted matte finish, a clear semi-gloss look, or a wet-look gloss finish. Sealers should not be applied more than once in three years. Too many applications will create a film on the surface which may discolor in sunlight. You can easily test whether your pavers are ready to resealed by dripping some water on your pavers. If the water initially beads, your pavers are still protected. If the water immediately soaks in, it’s probably time. For older pavers that have suffered from weathering and neglect, bring back the original shade of pavers or give them new color with NuLook Tinted Sealant, which is a semi-transparent semi-gloss sealer designed to rejuvenate faded pavers. 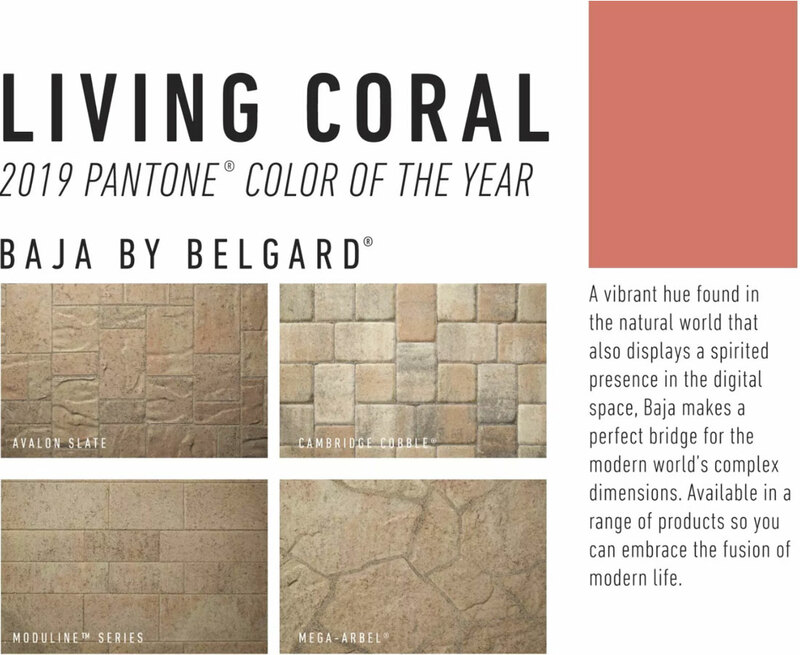 NuLook comes in four different shades to bring new life to pavers or create interesting designs. Whether you’re lighting an existing outdoor living area or planning a new one, here are a few ideas on how to light up your space. This lovely outdoor living room uses lighting techniques inspired by nature. The focal light emanating from the fire is enhanced by votive candles and low-voltage hardscape lighting that’s built into the walls of the outdoor fireplace. In the surrounding landscape, ambient in-ground lighting reflects throughout the picturesque waterfall. Uplights used for the shrubbery and trees add an ethereal glow. Fire can be used in a number of creative ways. This outdoor living room uses a European style fireplace and fire bowls that are all operated off of gas and can be turned on remotely. For additional fire elements, tiki torches are placed around the backyard to add a festive design element that coordinates with the “fire” design scheme. This design incorporates a variety of antique brass light fixtures, including attractive pathway lights in the planter beds and coordinating low-voltage hardscape lighting along each wall. Columns lights will both dress up a wall and provide additional lighting, as illustrated with the seat wall pictured below. This design also includes hardscape and overhead lighting in the bar area that allows for increased visibility behind the bar, without overpowering the fire pit area. Strategic use of pathway lights adds both character and an element of safety for a walkway or patio. The color of the light fixtures selected below incorporates complementary tones to those in the pavers, creating a cohesive design. In the poolscape below, low-voltage hardscape lighting was installed in a pattern that complements the sweeping arches throughout the design. To improve the safety, lights are installed on all steps and elevation changes, in addition to the seat walls. All lights in the hardscaped areas face downward, with upward lights facing the trees. The combination creates a subdued and cozy atmosphere. String lighting can be a festive way to add additional lighting and comes in a variety of styles to complement a wide range of design schemes. 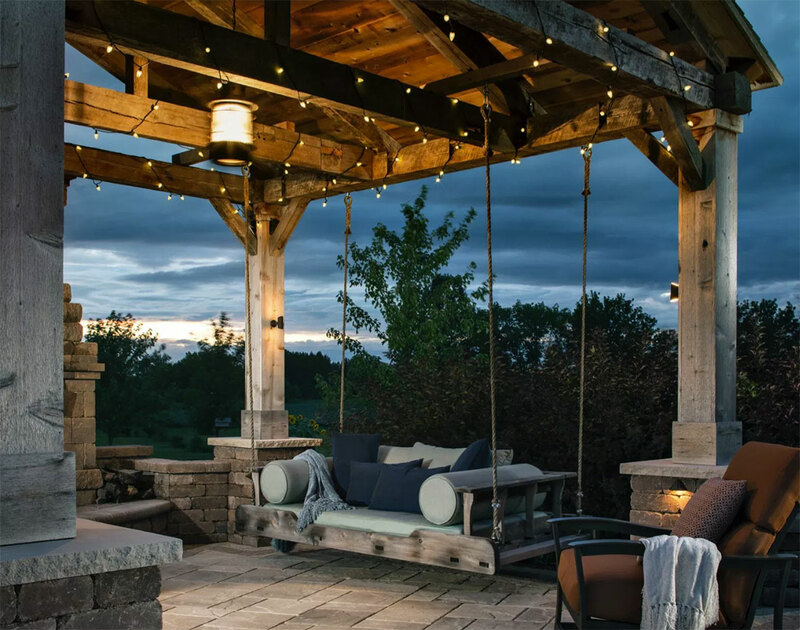 The outdoor pavilion below incorporates simple string lighting that creates a festive atmosphere without detracting from the richness of the rustic design elements. Additional lighting comes from pendants, sconces and hardscape lighting. The recent blast of arctic air sent temperatures plummeting across the country. Many of you are already stocked up on deicing agents for your walkways and driveways. Although deicing agents offer an immediate benefit, they can sometimes have a corrosive effect and diminish the beauty of paved surfaces. Just because the temperature has dropped doesn’t mean you can’t still enjoy the outdoors. There are a number of decorative ways to keep your outdoor spaces livable during the winter months that add both ambiance and warmth. Fire pits are currently one of the top must-haves in outdoor living, and with good reason. They easily fit into any outdoor living design and provide a spot for groups of any age to gather and enjoy the outdoors. Whether roasting hot dogs or s’mores, sharing a bottle of wine, or just having a cup of hot cocoa, everyone loves sitting around the fire pit. Outdoor fireplaces make a dramatic statement and become the focal point of your outdoor living design. 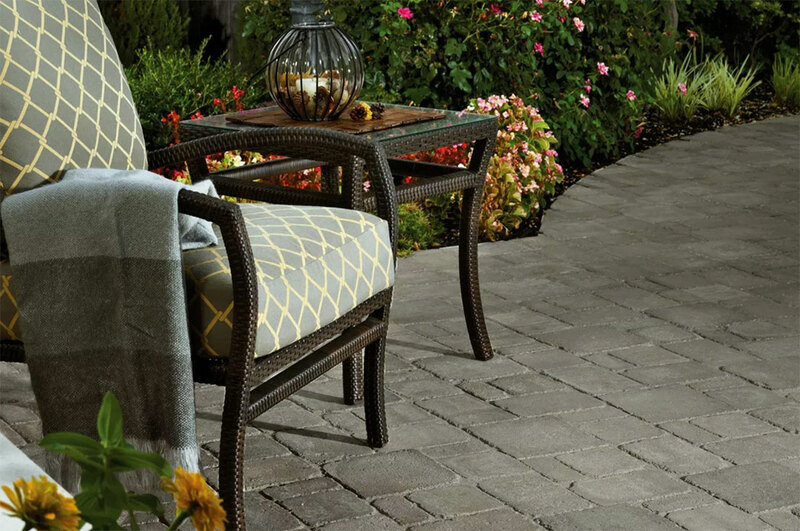 Not only will it add physical warmth to your outdoor living space, it will become the favorite spot for enjoying a glass of wine or an intimate conversation. When designing your outdoor living space, remember that gas fireplaces can be placed just about anywhere, but a wood-burning version will likely need to be 10 or more feet from any structure. Adding retractable solar shades to a porch will not only provide protection from the glaring sun in summer months, they can also help keep you warm in the winter by blocking the wind and helping to hold in any ambient warmth created by area heaters. Comfy throws not only add a cozy look to your outdoor space, they provide that extra layer that some folks need to keep warm. Decorative outdoor bins can be a good place to store throws; however, you may want to choose an easy-to-carry basket that can be stored indoors when not in use, which will keep your throws free of unwanted critters. Thank you, and Happy Holidays from all of us at Christensen Concrete. Christensen Concrete will be closed on Saturday, September 1st through Monday, September 3rd in observance of Labor Day. We will reopen on Tuesday, September 4th. Thank you, and we hope that everyone has a fun and safe Labor Day weekend. Christensen Concrete is having a big landscape and brick sale on Friday, August 17, 2018. Stop by for low prices on Pavers, Fire Pits, Brick and Tango Block- the versatile landscaping block perfect for your next DIY Project. We’ll also have specials on our Breeo Smoke Less Fire Pits! Swing by our location on West Highway 30 in Grand Island. We’ll also have free food from 11am-1pm, and we’re giving away 2 Husker Football tickets to the season opener against Akron. More than 1,500 of Nebraska’s brightest young minds participated in the SkillsUSA Nebraska Conference at the Heartland Events Center-Fonner Park complex. High school students competed in more than 100 areas of career and technical education including a masonry division that was helped in part by Kearney Crete & Block and Christensen Concrete Products Company. Judges in the masonry division were Grant Olson of Kearney Crete & Block, Jim Johnson of Summit Masonry, and Dustin Hasselmann of GH Construction. Scot Krosschell (Kearney Crete & Block), Bob Landers (Christensen Concrete Products), Jason Veggeberg (Christensen Concrete Products), McHale Armstrong (Kearney Crete & Block), David Alvarado (Kearney Crete & Block), and Eddie Cervantes (Kearney Crete & Block) handled the set up and tear down of the event and also helped with mixing the mortar to keep the students supplied with material throughout the competition. Christy Fizgerald (Kearney Crete & Block) attended the event as a representative of the Nebraska Masonry Association. The 2018 competition doubled the number of students competing in the masonry competition compared to 2017.